SustainableWork: "A national model for rural economic development, local food, and local jobs in the community for people of all abilities and talents"
"A national model for rural economic development, local food, and local jobs in the community for people of all abilities and talents"
Our friend and Innovation Kitchen partner Linda operates a wonderful food and farm based businesses known worldwide, but especially near the Twin Cities in Minnesota, as Marianne's Kitchen. Let me start by saying, 'Marianne's Kitchen Rhubarb Chutney' is amazing!! 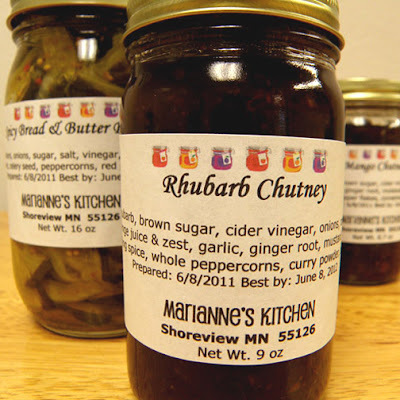 I love all Linda's products, but her rhubarb chutney we prepare at the Innovation Kitchen should be on the 'bucket list' of every person who eats. Linda and I talked and traded a few eMails this week about certified food processing services the Innovation Kitchen provides her business. Linda in a highly successful entrepreneur (13 years!) who runs her own farm based enterprise. Linda is also a rural health care researcher with unique perspectives on the value of the Innovation Kitchen to economic development. Rick, I enjoyed our conversation about the Innovation Kitchen. I can't say enough positive things about Annette and Scott and everyone at the Innovation Kitchen. I've worked in rural health care for the last eleven years, and the parallels between my work there and my experiences with the Innovation Kitchen are striking. In health care, rural hospitals have been struggling to survive because of the decline in population and employers in rural areas and the competition from facilities in larger cities, etc. Over the last eleven years, I've spent a great deal of time conducting focus groups with rural residents about where they seek health care--locally or in a regional center. I've also worked as part of a team demonstrating the economic value of using resources in your own community, supporting local businesses, and the impact that has on the circulation of dollars through the local community, schools, businesses, and so on. Clearly, using resources in the community has a very positive economic impact on the community, as well as enhancing civic pride. Institutions in the local community bring stability and economic value to the community. Local residents working with local companies, non-profits, etc. can mean many win-win opportunities. Thinking about the Innovation Kitchen, many of the same things can be said. Clearly, this facility is an asset to Mineral Point, to the county, and to the region. Like a rural hospital, it's an employer for people in the local area, it provides goods and services to local residents and people from elsewhere, and it enhances the dollars circulating through the local economy. And it has a broader impact, just like a rural hospital acts as a center for health care for the surrounding area. But I believe the Innovation Kitchen has a bigger story. While there are many rural hospitals, I don't believe there are many places like the Innovation Kitchen. It's the kind of resource that is sorely needed in many places - but has yet to be developed almost anywhere in the U. S. It is a bridge for entrepreneurs who want to create a new product or increase their capacity to produce their product to the realization/actualization of their plans. This is particularly helpful in food products because the learning curve is steep and the resources are scarce. I'll tell you my story. I've been a vendor at farmers' markets for 13 years. Over that time, I expanded the assortment of food products that I offer. A year ago that meant producing 1000 jars of canned goods in addition to my other products. I actually pressed two of my cousins into service to help produce these products. We reached the practical limit of our joint capacity. So, I began a search for a processing partner who would have enough capacity to meet my growing needs as I began to expand into sales to food and gift stores, but was not so large that I couldn't meet their minimum order requirements. I also was concerned that working with a large company would mean my loss of control over important aspects of how the products were produced. The search went on, literally, for months. I found no viable options in Minnesota. Then I remembered meeting Annette. I remembered sampling the pickles. Remarkably, I was able to find the business card and newsletter from the Hodan Center - clearly this was meant to be!! Working with Annette has been fabulous.....really, a dream come true. Annette and the Innovation Kitchen have made it possible for me to have a range of products in reasonable quantities so that I have enough inventory to carry me through, but not so much that there is no hope of being able to sell it all. This is huge in terms of remaining financially viable. Also, I've personally made all of the recipes that the Innovation Kitchen is producing for me. Frankly, they make some of them much better than I ever could! People are very interested these days in where their food comes from. I've built a relationship with customers over the past 13 years based on being able to tell them what's in a product, how it was produced, and how it tastes. I know, in working with Annette, that the things I told my customers when I produced the products will hold true when they open a jar from the Innovation Kitchen. The quality is excellent. People come back to my booth week after week telling me how much they enjoyed their pickles or jam or chutney. This is the basis of a great partnership. From working in rural health care and having a farm in rural Minnesota, I've thought a lot about rural economic development. Our farm is in a county with historically high unemployment. Over the years, I learned that I couldn't sell many canned goods at my rural farmers' markets because many of the local residents canned their own jams, jellies, pickles, and other interesting products from fruits and vegetables that they grew themselves. At the same time, my customers in the Twin Cities were clamoring for locally produced canned goods, often remembering tasty foods from their childhood or those made by a relative or because the food at the grocery store contains too many names they can't pronounce and don't want to consume. For a long time I wondered how I could bring these two forces together - rural food growing and preserving expertise and urban/suburban demand for locally produced food. Well, the answer is the Innovation Kitchen. It's a wonderful model for adding value to locally grown food products, educating the public about food and local food production, and for producing the kinds of foods that people fondly remember or that are about to become their new 'favorite' food. It's a model for rural economic development as well. Many of the people I met at rural Minnesota farmers markets could have developed some of their products into a small food business that could provide income for their families. But there just haven't been the local resources and expertise available to translate their ideas and home-made products into viable small business ventures, especially in areas like the food science aspects of this type of business. A place like the Innovation Kitchen could make all the difference in translating ideas, recipes, and practical skills into an income-producing venture for many rural families. Of course, the other benefit is jobs. The Innovation Kitchen employs many people from the surrounding area. In rural areas, jobs are hard to come by. But many people living in rural areas already have many of the skills needed in food production. Giving people the opportunity to work, to have a job, in the area where they live, rather than having to commute long distances, is a huge benefit. Clearly, this is the kind of model that could have major impacts on rural economic viability if it were to be replicated across the region or the nation. I'm just thrilled with the Innovation Kitchen. Because of their training, I have complete confidence in the products that are being produced. The products look great and taste great. I feel that I'm in a partnership with people who are working every day to help people be successful...both the people who work at the Innovation Kitchen...and people like me who are working with the Innovation Kitchen. Currently, our country is going through a rocky period. People are uncertain of their jobs and their financial futures. As a nation, we wonder if we've lost our manufacturing edge and wonder what the keys will be to future success and financial stability. An enterprise like the Innovation Kitchen could be one model for moving us forward in regaining confidence in our abilities and self-sufficiency. The possibilities from adding value to locally grown foods and creating jobs in rural and agricultural areas in value-added food production are enormous. The economic development potential is huge. And, as a foodie, the thought of lots of people creating delicious new recipes from locally-grown food may be....I'd say icing on the cake...but maybe that should be chutney on the roast or pickle on the sandwich (there must be an appropriate metaphor). Thank you Linda! Wonderful insights and valuable perspectives. It's an honor to be a partner with your business and a contributor to your vision!